Mortality Minute radio and online video mini-programs get the end-of-life conversation started for a range of businesses: funeral homes, cemeteries, estate planning attorneys, hospices, and insurance agencies. If your business centers on end-of-life issues, sponsoring Mortality Minute in your local market will make customers sit up, take notice, find your website and call! Each 60-second Mortality Minute mini-program provides a light look at serious subjects related to death, dying, and developing trends in end-of-life issues. From cremation to caskets, obituaries to obesity, Death Cafes and more, these upbeat Mortality Minute spots educate listeners on what they need to know before there’s a death in the family. 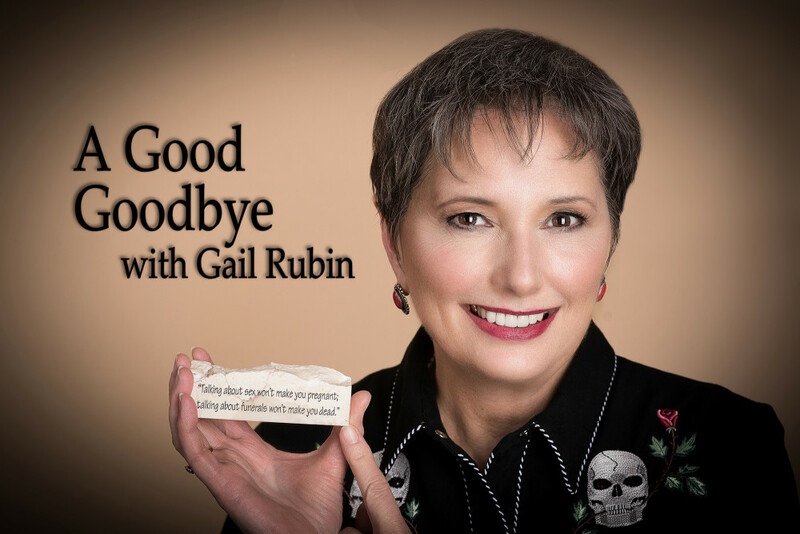 The series is hosted by Certified Thanatologist Gail Rubin, The Doyenne of Death®, host and author of A Good Goodbye: Funeral Planning for Those Who Don’t Plan to Die. It was created by Ms. Rubin along with creative director Dan Katz of LA ads – A Marketing Agency. Every radio spot or online video concludes with a 10-second slot to allow a customized sponsor’s message for their own company. As a sponsor of Mortality Minute programs, your business will really get noticed in your local media! You could even get local news coverage about your business utilizing this unique approach to informing while advertising. These topics are currently available in professionally-produced MP3 spots for radio. The asterisk (*) indicates versions are available for Canadian as well as U.S. audiences. Avoid Identity Theft of the Dead | Buying a Burial Plot | Cemetery Costs | Cremation Rates* | Death Cafes | Embalming is Optional | Five Things* | Funeral Etiquette | Funeral Finances* | Living & Dying Large* | Medical School Plan B* | Personalizing Memorial Services* | Pet Loss* | Price Lists/The Funeral Rule* | Obituary Writing | Online Obituaries | Shopping Around | Social Media | Thank You Notes | Who Gets to Speak? Use the embedded media player to listen to these demo Mortality Minute spots on pre-need shopping around, funeral etiquette and how Jewish burial is naturally green burial. This 60-second spot includes ten seconds at the end where sponsors promote their business within the spot. Each Mortality Minute sponsor will have geographic exclusivity, making their business the only one in its respective area offering this engaging content. Contact Gail Rubin at 505.265.7215 to discuss how a Mortality Minute sponsorship can help your business truly stand out in a cluttered media landscape! If you prefer an online video for your website, customized video versions of Mortality Minute spots can be prepared especially for you. Here is an example of a spot about Jewish traditions prepared for Waldman Funeral Care in Houston, Texas.